The ever-educational Nikkei tells us this week that increasing numbers of Japanese are turning away from the high-tech maelstrom that peppers our senses to find solace in the traditional, but little-known, Japanese pastime. Kodo practitioners typically gather in a ceremony led by a master and take part in a guessing came known as Kumiko. The idea is to work out which kind of incense wood has been placed in each burner they’re presented with – a bit like a very Eastern sommeliers’ association, perhaps. Legend has it that Kodo began with a log of incense wood that drifted ashore on Awaji Island in 595. Incense was first used in Buddhist rituals to purify sacred places and ward off evil. 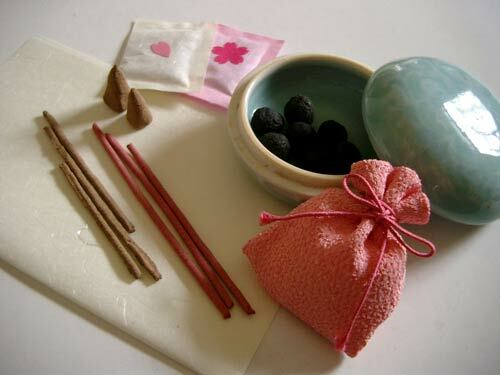 Nobles started to use incense during the Heian period (794-1185). The Tale of Genji and The Pillow Book, both written by court ladies, show that incense was essential to the sophisticated lifestyles in the Imperial court [and] the rules and styles of Kodo were established during the Muromachi period (1338-1573). Better yet for the Japan aesthete, there are several hundred different Kumiko themes, with one featuring a fragrance-recording system based on The Tale of Genji, sounding particularly erudite. Anyone wanting to find out where to join a Kodo ceremony and test their olfactory senses for themselves, could do worse than check out Shoyeido Incense’s stores for details of their courses [Japanese].